Raymond Jones was educated at the University of Wales, Aberystwyth and the University of Cambridge. He obtained a PhD from the University of New England, Armidale in 1973. After training in tropical agriculture at the University College of the West Indies in Trinidad, he spent four years in Kenya as an agricultural officer with the British Colonial Service. In 1960, Jones was recruited to work at the Cunningham Laboratory in Brisbane by Dr Jack Davies, the then Chief of the CSIRO Division of Tropical Pastures. The whole of his time in Australia he worked for this Division and iterations of it. 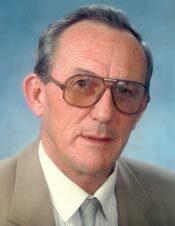 His main research interests were in the development of sown pastures, firstly in the sub-tropics then in the tropics when he was moved to the CSIRO Davies Laboratory in Townsville in 1976. Dr Jones was appointed Assistant Chief of the Division in 1982, and he served as Acting Chief from 1984 until 1986. He retired in 1998, but continued working as an Honorary Research Fellow at the CSIRO Davies Laboratory with the Division of Sustainable Ecosystems which had accommodated part of the Division of Tropical Crops and Pastures. Dr Raymond Jones solved the problem of leucaena toxicity in ruminants.